The teddy bear mascot has to be the most popular figurehead the world has ever known. The teddy bear must have appeared in one form or another to promote, sell and celebrate every conceivable item in it's relatively short history. Do you have a favourite bear mascot? So what is a mascot? Traditionally mascots are thought to bring luck and good fortune and this may be why many sporting organisations and clubs use them to represent their teams. Let's take a look at some of the more famous teddy bear mascots from over the years. Depending on where in the world you live you may be very familiar with some of them. During the re-election campaign small teddy bears were given away to President Roosevelt's supporters, helping to increase his popularity. These rare bears are now very valuable. In 1944 forest fires were prevalent in the US, the US Co-operative Forest Fire Prevention Program decided to run a campaign to raise awareness and advise the general Public on how to prevent such fires from being started by accident. Originally the Walt Disney character of Bambi was used to promote the campaign but after a year it was decided to create a special character to represent the campaign. Smokey the bear was the outcome, a cuddly, friendly and authorative teddy bear which all could relate to. 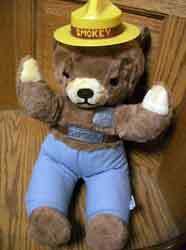 Smokey was depicted wearing a ranger uniform, sometimes complete with bucket and spade too. Smokey continues to this day in the US to promote prevention of forest fires, he must be one of the most popular and long lasting teddy mascot there ever was. 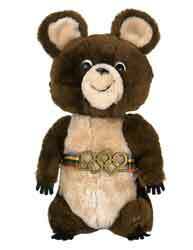 Although teddy bears are a popular choice for sporting teams, perhaps the most famous bear ever created for a sporting event is "Misha" for the Moscow Olympics in 1980. The choice of a bear was s simple one for this event as Russia is often called "The Bear" and the name Misha is a popular nickname in Russia for a bear. However it still took six months for the designer to come up with the perfect look for the bear. The final design of a small short legged bear with a big happy grin and sporting a belt made up of the five Olympic rings turned out to be one of the most popular Olympic mascot ever. Do a quick search online and you will find many charities using teddy bears to promote their cause. But perhaps one of the most famous charity bears in the UK is Pudsey bear. 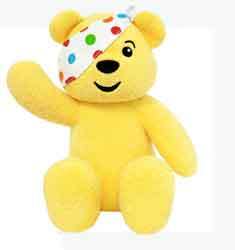 Pudsey bear is a bright yellow bear with a red spotted handkerchief tied around his eye. He was created in 1985 for the "Children in need" appeal, a televised show raising money for disabled or disadvantaged children all over the UK. The appeal has run every year since and Pudsey has become a very recognisable figure both on the TV and in the high street. He can often be seen shaking his tin up and down the country every November and of course appears on hundreds of promotional items. He has helped to raise millions of pounds over the years and I'm sure will continue to do so for many years to come. The Big Bad World of Advertising. The teddy bear mascot has proven to be such a winner with people of all ages and sexes that it is not surprising that the advertising world has often chosen the teddy bear to help sell their products. Perhaps the most famous of these is a bear called "Snuggle" which is used the world over to promote fabric softener for the Lever Bros Company. This bear is recognised the world over and although may be known by different names (Robintje in Holland and Kuschelweich in Germany for instance), he has proven to help with sales. The Teddy bear mascot looks set to continue to be a firm favourite of choice for ever more to help promote, sell and raise awareness. In fact I bet right now that somewhere in your home you will have a teddy mascot lurking somewhere, reminding you perhaps of a special event or place. Long live the bear mascot. Have You Got A Favourite Teddy Bear Mascot?